Situated just south of Thunderclap and due east of Trampolina, you won't find Catapult on the map; it's not there by design. Voted up in a referendum, tourism is about the last consideration for generating income for the town of Catapult. But if you happened into the vicinity and asked how to get there, the response you'd most likely get is that it's "about three owls, that way." In the heart of the sun-gilded hills of California lies a quiet place that will never see the fame of this westernmost strip of land in the country, its avocados and surfboards, that Catapult's name is so cavalierly uttered alongside. Located in a state that regards itself as so progressive it refers to nearly every place of any importance as a City, it is odd indeed that this bastion of simplicity lies like a refuge, a mecca, to those who are lucky enough to discover it. Consequently there's a lack of anything characteristic of gluts, of any sort -- population or otherwise: no ATMs, no chain stores, no cable, no pizza joint, no traffic lights and no traffic. Never a wait in line, except maybe on Friday night when film buffs pile into the Stranded for a movie, a communion of town emotions, in the dark. Perhaps most remarkably in this hyper-techno-cyber-age, in all of Catapult--which spans far across woodlands, sub-alpine forest and foothills and boasts a river running through it--there is only a single computer. This one. Though there are many such stories, the Legend of the Owls is told most poignantly in the story of a young boy. That when the town was originally settled, the son of the gold miner Efram Pfister, Pfechulae Pfister, went off into the hills and promptly lost his way, straying ever deeper into the wild Sierra forest. Night set in; along with it one of those unpredictable storms. You know, a squall that ravages the foothills suddenly, without warning. The sky just exploded onto the land bringing torrents of rain and lightning to scare the bejesus out of the hardiest of souls, applauded by ear-splitting, rolling thunder. The storm passed, and the small Pfister sat aquiver under a giant oak tree, head buried in his lap, collecting his thoughts which were now quite drenched, when he was startled by the call of a Great Horned Owl closeby. The hoot came one long, then two short, repeated four or five times. Pfechulae listened. The child was insinctually drawn toward the calls, making his way close enough until he noticed that the owl was being answered by yet another Great Horned about half a mile away. He looked briefly into a reflection of the moon in the owl's eyes. Then he followed the calls from the first on to the next, when the night air, vibrating with a fresh, cold crackling ionization, was pierced by yet a third caller in a chain forming a still melody that the boy followed like a song. He soon found himself on a hillock overlooking familiar lights and the equally familiar din of heated debate coming from the DrinkUpAndGetOut. Pfechulae Pfister had arrived home, delivered by three totems of Athena, protected from the ferocity of Nature by her own stalwarts looking after their human kin. Lucky boy. The story has repeated itself time and again, with the list of people surviving in a manner now legendary: a yuppie lawyer from Cincinnati who drove his Carrera into a ditch and walked thirty miles in circles; a big shot Hollywood producer and his girlfriend from Bel Air scouting for a film location; the young Chinese newlyweds from Harbin Province on their honeymoon who thought they were near Graceland. Even the great Mickey Mantle, God rest his soul, who is said to have stumbled through these woods during a binge in his later years, was rescued by the watchful eyes (which blink separately, by the way, eye and eye!) and the plaintive calls of Catapult's most well-known talismen. But in the world of animal magic it's only the tip of the iceberg. We are privy to a special source of protection in Catapult. I sometimes stare down at the town from my hillside estate and quickly become lost in thought. Something blew Catapultians out of the everyday. Something attracted the Owls. Like a magnet, these folks are held here. The town holds Clyde and Wanda, who work in the Book Store, and caterwaul some Saturday nights. Or the mysterious Rajasthani Indians, Vajra and Moksha, who run the General Store and seldom speak. There's no real mystery about why such an odd collection of human beings should come together in a place that's as far out of the way as, say, the home to a resident no more unlikely than the rest of us: village saint, Norodom Balatalangsarangtangaramrabangtangnangalangsrambang -- his friends know him as Hobie -- who came here from Bali. Or what exactly happens when Hobie bursts into DrinkUpandGetOut shouting "Gutaratana! Gutaratana! "and what effect it has on old Yankee lobsterman, Brainard Ames who, by the way, is a 400 pound vegetarian! Ever heard of a 400 pound vegetarian? We've got one! This man is a giant. There is a larger than life feel in these hills. There is a dream happening. I am part of it. Alan Watts recommended you not expect any of society's services when you decide to live outside it. He also said "When you walk, walk, when you sit, sit--but above all, don't wobble!" Sage words. The town is not meant for some, but it holds me. I am much a part of this town as any other. I am held apart from it, though, by my money. But I wouldn't have it any other way. A bittersweet reward for a life of some hard work, but not too much. Strange circumstances. Who am I exactly? I live alone in this 30 room mansion on the ridgeback, in the only mansion in Catapult. I am prone to loping around these vast rooms like any other primate. I even contemplate like a monkey, absently, scratching my chin with a large hand, spellbound when the rains beat down on the quiet town. Sometimes I glare down at the town and clench my fists in fury, banging on the windows. The valley only stares peacefully up at me in my rage. I stand framed behind my own glass, like a caged animal. And at other times, I have been known to walk through Catapult kissing those who were like me, attracted to this place. After the shock, there is always a little glint of glee that twinkles in their eyes when they are reminded: there is magic here. Catapult is lovely, and, although it survived all the hubbub from the last century, it is blessed with its own little pit of problems. Like anywhere else down on the flat, the human condition brews, under the majestic watch of the owls, a careful trinity. And that trio of winged creatures, which are not birds, watch over this town which is not a City, and its human aggregate, a virtual stockpot of humanity, who left their birthplaces and arrived here bound by a distinct yet subtle common thread. A new story. An old town. Radio Station: KUSF-fm, 90.3 on your dial. 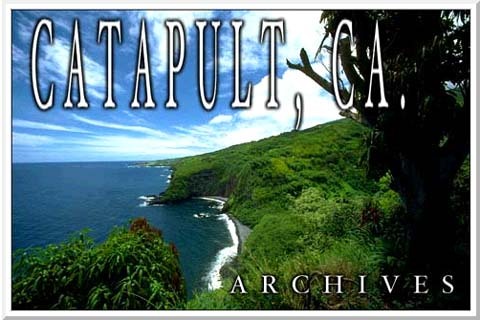 The broadcasting debut of Catapult, CA.